Amazon jammed a number of great features $80 entry-level Kindle e-reader ($100 if you want to be free of Amazon’s “special offers”). It’s lighter than the combined weight of the company’s Oasis flagship with its battery cover attached, and with no backlight to power, it can run for far longer than more capable e-readers—a month or more, depending on your reading habits. And did we mention its sub-$100 price tag? Unfortunately, after spending the last several weeks using one, I don’t believe any of those perks compensate for this new Kindle’s copious shortcomings. Weighing a mere 5.7 ounces and measuring 6.3 x 4.5 x 0.36 inches, the 2016 Kindle is light and compact enough to allow for long, comfortable reading sessions, even if you’re holding it with one hand. It feels surprisingly sturdy, too. I love the more-expensive Kindle Oasis for its size and weight, but I live in constant fear of dropping it or discovering that the heavier stuff it shares space in my backpack with has destroyed it. Not so the latest Kindle. It should survive most casual abuse, but be aware that it’s waterproof or even water resistant. If that’s important to you, check out the Kobo Aura H2O or the Kobo Aura One. The All-New Kindle’s rounded corners make it feel good in the hand, and I appreciate that Amazon has shaved down the thickness of device. But the slick feel of the plastic that the e-reader is constructed from makes me grateful that it’s as resilient as it is. I have no doubt that sooner or later, I’ll wind up fumbling the thing. 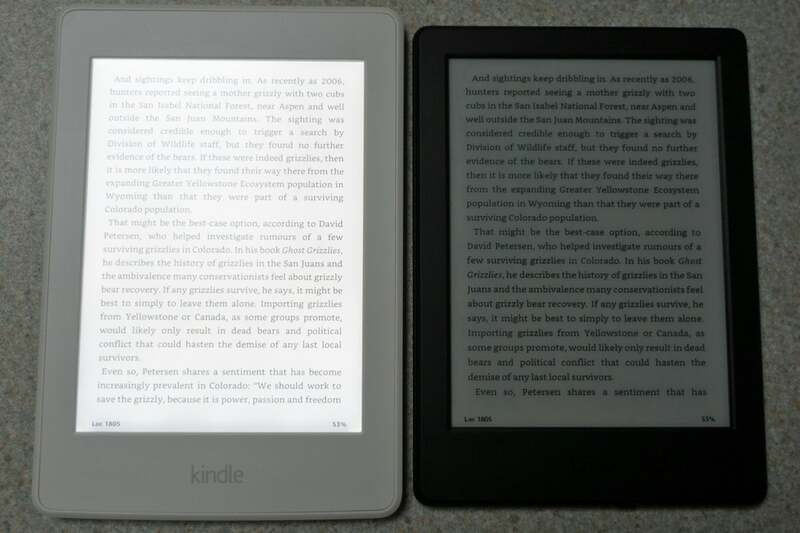 Even in dim light, the new budget-priced Kindle can be difficult to read, especially when compared to an e-reader with a backlit display, such as the Kindle Paperwhite (left). The new Kindle has no physical buttons, save one for powering the device on and off. It’s located on the bottom of the E-reader, next to its micro-USB charging/data port. You’ll find a USB cable in the box, but no power adapter to go along with it. That’s one of the ways Amazon reduces its e-reader prices, and makes money on accessories after the sale. Six inches is a popular size for E-Ink displays these days. 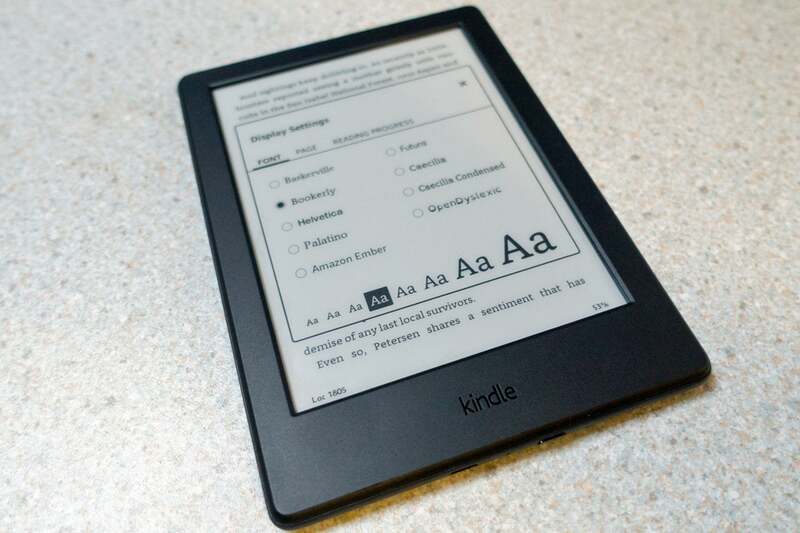 Every device in Amazon’s current e-reader lineup has one, as do most of the ones from companies such as Rakuten Kobo, Icarus, and InkBook. The new Kindle is no different. Its six-inch E-Ink display is set into the device slightly lower than the bezel framing it. Without physical buttons for transitioning to a new page or interacting with the e-reader’s user interface, I found it hard to use with one hand. Moving my thumb to touch the screen repeatedly caused me to lose my grip. You might be able to live with needing two hands to read books on the new Kindle, but your eyes won’t appreciate reading a display that delivers only slightly more than half the resolution—167 ppi--that pricier e-readers offer. The displays on the $120 Kindle Paperwhite, the $130 Kobo Glo HD, and every device further up the scale boast resolution of 300 ppi. The 2016 Kindle’s text is legible enough, but I found that my eyes tired more quickly than they did after reading other e-readers. The device’s janky text can be hard on the eyes, especially in dim light or under lamp light. And that leads me to my greatest complaint about the All-New Kindle: Its lack of backlighting. The 2016 Kindle’s responsive touchscreen makes changing fonts and other functions easy to do. One of the great joys of owning an e-reader is that it makes reading possible almost anywhere. Books weigh a ton, making it undesirable to carry more than one or two on a vacation or even across town. 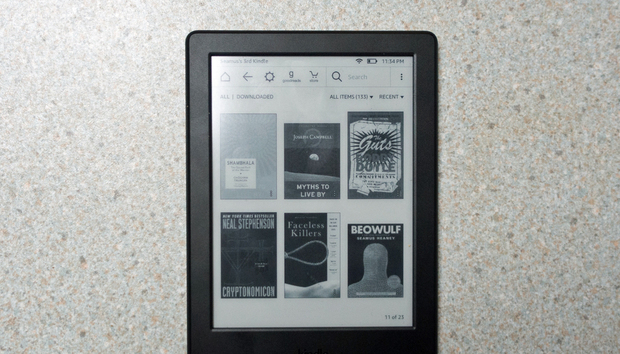 The new Kindle can store thousands of books that you can read at a moment’s notice. It shares the same operating system and has access to the same seemingly endless array of free and for-purchase books as the rest of Amazon’s reading devices and tablets. It can also open PRC, MOBI, TXT, and PDF files, although not always to good effect. Unlike an LCD tablet, you can read text on the new Kindle even in broad daylight; reading in the dark, however, is just about impossible because there’s no backlight. That can make reading in bed difficult, especially when the person next to you is trying to sleep and objects to your using a bedside lamp, and it can be even more problematic if you’re on a train, plane, or bus. Sure, you could spring for a lip-on reading light, but if you’re going to spend another $20 to $40 for that, you might as well step up to the latest backlit Kindle Paperwhite.